I know I've said before that I'm a fan of cookbook author Marlene Sorosky. But what I haven't told you is that I own every single one of her cookbooks now. Last weekend, I searched online for the missing ones from my collection, and ordered all of them in one giant credit card blow. I was tired of staring at the void in my cookbook bookcases, knowing that some of her books were not there. I had had enough! Some people collect vintage Barbie dolls, some collect stamps or coins, I collect cookbooks. 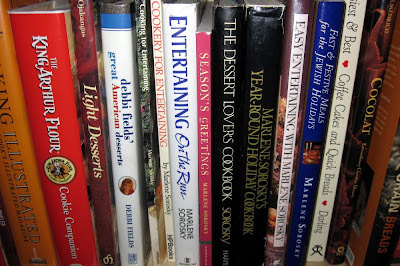 It's not about having every single cookbook that was ever written. But it is about having every single cookbook by my favorite authors. Over time, I'll complete my Beatrice Ojakangas, Lou Pappas, Carole Walter, Beth Hensperger, Marcy Goldman, Lori Longbotham, and David Lebovitz collections, and a few others. 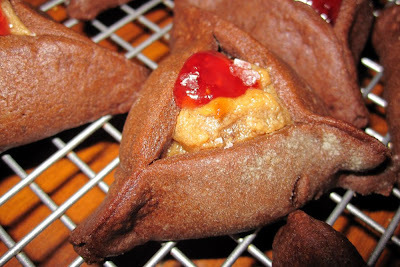 This recipe immediately stood out to me because it's not your conventional hamantashen (which I do really like, too). 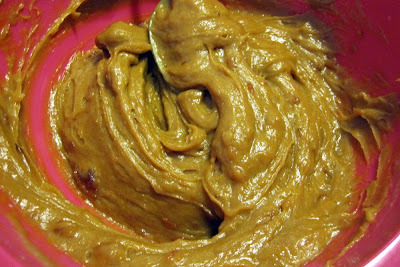 It's a chocolate dough, and a winning combination of peanut butter-strawberry filling to go with that chocolate. 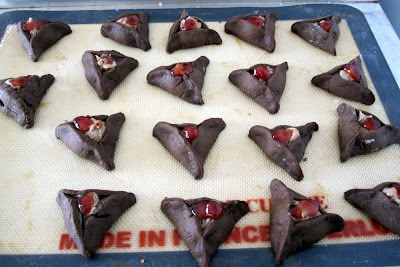 It looks really neat to include in your mishloach manot care package to give your friends and family on Purim along with more traditional hamantashen, fruit, and snacks. Since I'm going through a fancy salts phase/obsession and newly purchased Maldon sea salt, I sprinkled a few flakes on the just-out-of-the-oven cookies to finish the look. 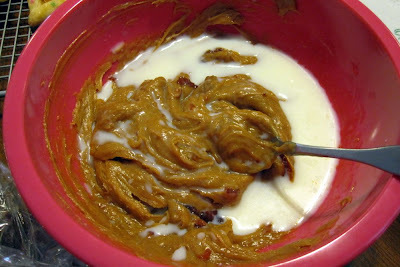 You certainly don't need to, but my taste buds were very happy with the result! 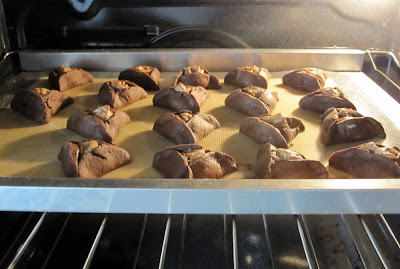 Place rack in upper third of oven and preheat to 350 degrees. 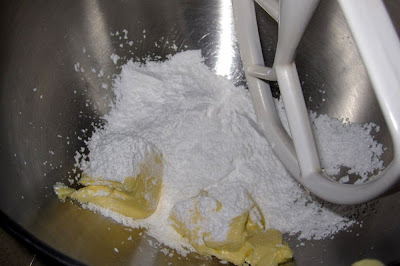 Grease or spray 2 heavy-duty or cushioned baking sheets. 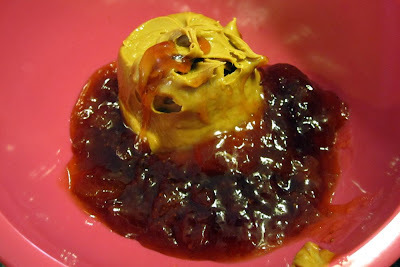 To Make Filling: In a medium bowl, stir peanut butter and jam together. 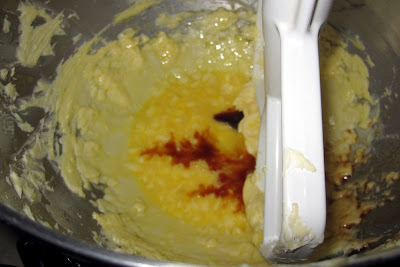 Stir in milk. 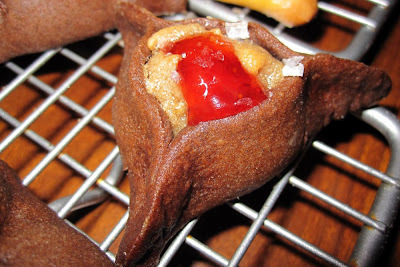 To Shape Hamantashen: Divide dough in half; cover 1 portion with plastic wrap. 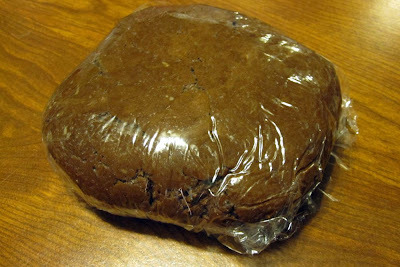 Roll other half between 2 sheets of wax paper into an 11-inch circle, about 1/8 inch thick. 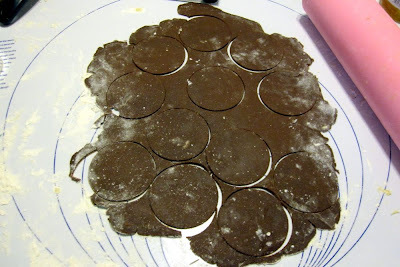 Using a 3-inch round cutter, cut out circles. (A clean, empty tuna can with both ends removed makes an ideal cutter.) Spoon 1 1/2 teaspoons filling in the center of each circle. 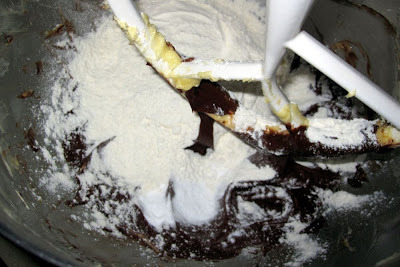 Press 3 edges together to make a triangle, leaving a small opening in the center for the filling to show. 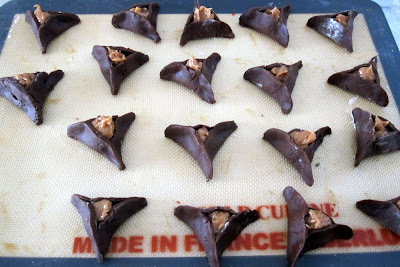 Place 1 inch apart on prepared baking sheets. Reroll scraps, cut out, and fill. 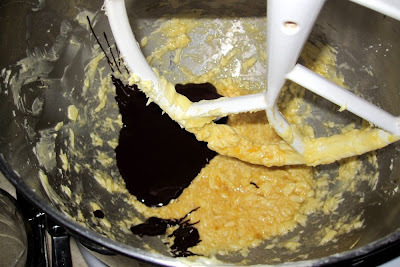 Repeat with remaining dough. 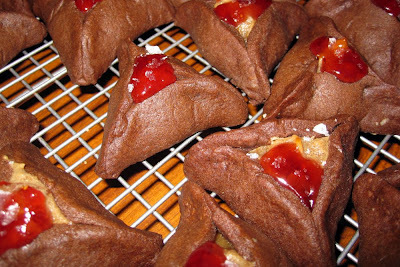 Great pictures of your hamentaschen and of your cookbooks! 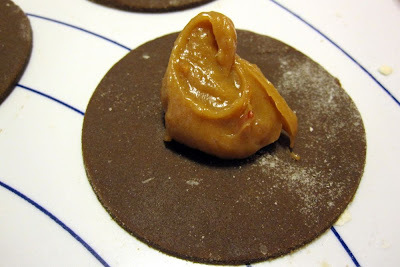 I know the chocolate peanut butter ones are great since I made them, too! Marlene Sorosky is so amazing - baked goods and savory...you can never go wrong!!! Don't you love that Maldon sea salt? So light and flaky. Just such a pleasure to use to finish so many dishes. Thank you for sharing with me--perfection with a cup of tea for my dessert! That bit of sea salt just made them. mmm.